When I was researching and reading about the history of the church I read the little book by the former Rector, Gerry Matthews. In it he reports that in 1760 the Dean of Exeter made a Visitation to the church and reported that there were three bells in the church and that a feast was held on the Sunday after St Peter’s Day. He also reported that a deer park north of the church, full of timber was destroyed in the great storm of 1703. This sparked my interest as I live in the area that was the former deer park and so I found out more about this storm. 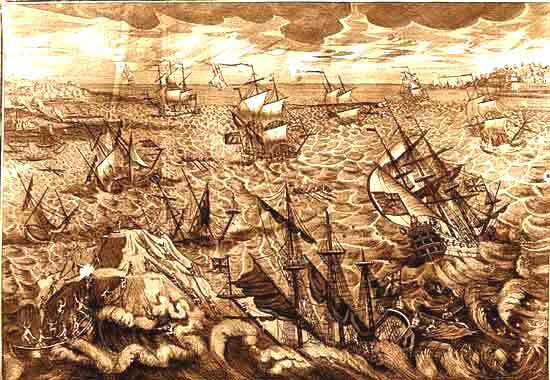 As we have recently experienced, the British Islands lie in the direct track of storms coming in from the Atlantic, and there have been many great storms in English history, not a few of which have left their mark. But there is one “Great Storm,” and one only, though attempts have been made to fasten this title on other tempests. Before the nineteenth century there was no scientific way of measuring the fury of a storm, it is only possible to judge the storms of earlier days by the havoc which they brought, and the impression made by them on the minds of the men and women who experienced them. Subjected to this test, the ‘Great storm’ entirely justifies its title. It destroyed more property and caused the death of more people, both on land and sea, than any other known English storm then or since. There can be no doubt that the wind blew with true hurricane force, and that it maintained its strength for an unprecedented time. It is not very uncommon for a severe winter gales, for example, that of January 26, 1927, to develop squalls of hurricane force; but, to judge by its results, the ‘Great Storm’ did something more than this in its continued violence. It is quite likely that this storm, like that of 1987, was the result of a ‘Sting Jet’. This is produced by a distinct jet of air which starts out three or four kilometres above the ground and descends over three or four hours. Snow and rain falling into it evaporate and cool it as it descends, helping to accelerate it to high speeds of more than 100 mph. 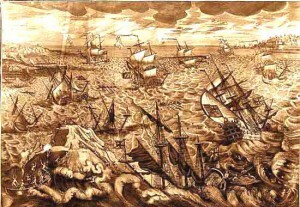 Its greatest fury was experienced south of a line from the Bristol Channel to the Thames and the horror of the storm was emphasised by the fact that its most destructive period was confined to the hours of darkness, which, as it coincided with a new moon, was absolute. Contemporary reports show that there was extensive and prolonged flooding in the West Country, particularly around Bristol. Hundreds of people drowned in flooding on the Somerset Levels, along with thousands of sheep and cattle, and one ship was found 15 miles inland. At Wells, Bishop Richard Kidder was killed when two chimneystacks in the palace fell on him and his wife, asleep in bed. This same storm blew in part of the great west window in Wells Cathedral and major damage occurred to the south-west tower of Llandaff Cathedral at Cardiff. Like here in Thornbury, the greatest of all the damage in the countryside was to the standing trees. That shallow-rooted trees like elms should be overturned is not remarkable, especially when we remember that the season had been wet and the ground was sodden; but the wind also felled great oaks and beeches which were snapped off through their thick trunks, and whole orchards were destroyed. A plaintive cry came from Somerset that the loss of their apple-trees promised a shortage of cider!